The Enugu State Police Command has arrested six notorious bandits that had been terrorising residents of the state. According to a statement by the command’s spokesperson, Mr Ebere Amaraizu, following a tip-off from some members of the public, its operatives in Adani Division in the early hours of Saturday, September 10th, nabbed six notorious armed bandits that have been terrorising the lives of the innocent citizens of Opanda,Nimbo and Adani Axis of Uzouwani local Government Area of Enugu state and its environs. 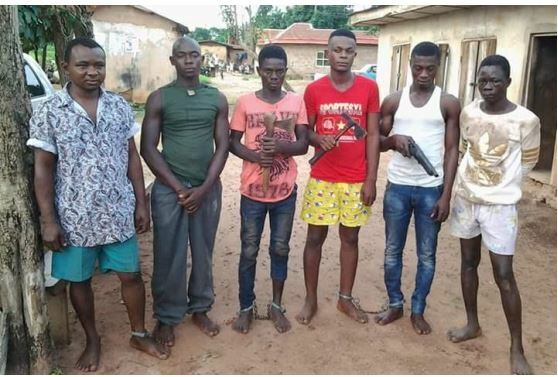 The suspects who gave their names as Ernest Umeh,Okwudili Ugwuoke,Sunday Agbo,Arinze Agu,Ezeata Ugochukwu,Arinze Agu and Nnamdi ojobo are helping the police in their investigations in relation to their alleged nefarious activities ranging from armed robbery, burglary, amongst others. The command has launched a manhunt for the remaining gang members. Items recovered from the suspects included locally made gun,two short axes and some exhibits like TV Set,DVD,six handsets suspected to have robbed from their various victims,standing fan amongst others. The State Commissioner of Police, Emmanuel Ojukwu has applauded the effort of his men and the synergy between his operatives and members of the community and maintained that the command under his watch will continue to partner communities,sister security agencies and all relevant stake holders to ensure a safe and secured environment. SEE The Pictures Of President Buhari’s First Wife, Safinatu Buhari.